For an ever-changing world of business, it's never enough to learn of new marketing strategies. The economics of business evolve as the world evolves. Advances in human resources & technology, breakthroughs and discoveries and new perspectives require that marketing constantly adopt to these changes. Also, learning from actual stories and experiences also help us to decide what is effective and what is not. Fortunately for the general public, Ned and Ardy Roberto releases marketing solutions book. 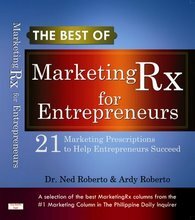 "The Best of MarketingRx for Entrepreneurs", by authors Dr. Ned Roberto and Ardy Roberto, is a selection, by these two marketing consultants who are also successful entrepreneurs, of their best, most useful columns in Philippine DailyInquirer since 2003. A wealth of information and experience is compiled and handed to the public and business sector. There are over 20 of their best articles compiled in this book with topics covering mobile marketing, celebrity endoresements, pricing, distribution, branding, market shares, customer satisfaction, product success and many more. The Best of MarketingRx is now available for purchase through credit card and PayPal via their blog and available at leading National Bookstore and Powerbooks branches.